Restaurants are like the sous-vide dishes that often appear on their menus: constantly under pressure and simmering with innovative ideas. Think tasting menus and molecular gastronomy – unarguably cutting edge, regardless of whether you liked it. But when it comes to technology innovations, Canada’s 97,000 restaurants tend to take a back-burner approach. Loreto Saccucci is CEO of BlueRover Inc., based in Kitchener, Ont. His company developed technology that monitors and controls temperature and humidity in food delivery boxes. This is changing. The past five years have seen more technology-driven advances in the Canadian restaurant industry than in the preceding half-century, Mr. Carter says. Servers in many restaurants now enter orders into electronic point-of-sale (POS) systems instead of cash registers. Customers who want to settle their bill with a credit card pay through a handheld machine brought to their table. Meals are delivered to people at home by UberEats or Foodora. Just how exciting and disruptive? Christopher Barry, director of membership at Restaurants Canada – a not-for-profit organization representing the country’s $85-billion restaurant and food-service industry – points to a number of sophisticated technologies that have found their way into the sector. Restaurants are also starting to use interactive technologies, Mr. Barry says. At Graffiti Market in Kitchener, Ont., customers tap on their internet-connected “smart tables” to order food, watch their meals being prepared through a webcam in the kitchen, play video games and pay their bill. Alex Barrotti is founder of TouchBistro. Electronic point-of-sale systems for restaurants have also leapfrogged into the 21st century. 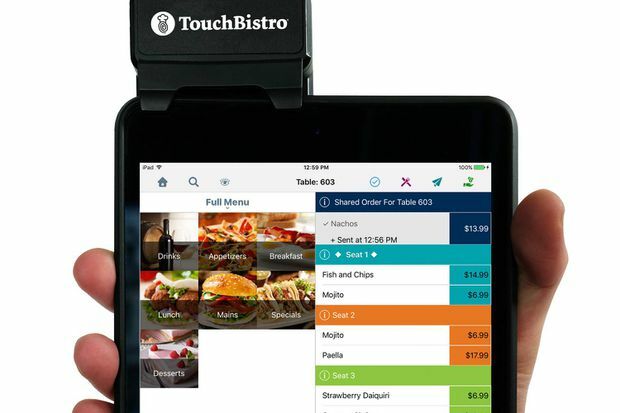 TouchBistro, a made-in-Canada food and beverage point-of-sale app, is used in more than 15,000 restaurants worldwide. With TouchBistro on their iPads, servers can tap in orders, which are sent automatically to the kitchen. Alex Barrotti, founder and chief executive officer of Toronto-based TouchBistro Inc., says his product can shorten the ordering process by seven minutes a table. In addition to accelerating the ordering process, TouchBistro helps restaurants increase revenue by prompting servers to up-sell with food or drink recommendations. TouchBistro also ties together third-party applications such as accounting, inventory control, staff scheduling and management, reservations and online ordering. Using TouchBistro, servers can tap in orders, which are sent automatically to the kitchen. Technology that accelerates the ordering process is also changing the customer service experience and improving operations at Boston Pizza International Inc., which has more than 380 restaurants across the country. The chain is testing a mobile app that allows customers to use their smartphones to place orders, ask for drink refills, call a server to their table, and pay the bill. BlueRover's tech in a food delivery container. Food quality and safety is also getting a boost from innovative technologies. Boston Pizza uses automated sensors connected to the cloud to monitor appliance and food temperatures. BlueRover recently launched an innovation that addresses product quality and safety issues: delivery boxes with GPS tracking and the ability to monitor and control temperature and humidity. These are exciting times for the restaurant industry, says Mr. Carter at NPD Group. As millennials enter the business, and as more consumers embrace digital innovations, technology will become more pervasive. It also helps that tech providers are starting to introduce pricing models that recognize the financial constraints faced by restaurateurs. BlueRover, for instance, charges a subscription fee of about $100 a month for its kitchen monitoring system.